Sericulture industry is labour oriented agro industry employing 70 lakh people (5 lakh are sericulture farmers and the rest are stakeholders such as reelers, twisters, weavers, printers etc.) in India. About 23060 tonnes of silk is produced in India annually, which generates a turnover of Rs.25000 crore of which Rs.2500 crore is exported. Silk production today is a blend of ancient techniques and modern innovations. The first stage of silk production is hatching the silkworm eggs, which have been previously examined and shown to be free from disease. Larvae are then fed cut-up mulberry leaves and after the fourth molt climb a twig placed near them and spin their silken cocoons. The silk is a continuous-filament fiber consisting of fibroin protein secreted from two salivary glands in the head of each larva, and a gum called sericin, which cements the two filaments together. Pupae within cocoons are killed by steam or fumigation to prevent adult emergence, which would cut and tangle the silk filaments. Cocoons are later softened in hot water to remove the sericin, thus freeing silk filaments for reeling. Single filaments are drawn from cocoons in water bowls and combined to form yarn. This yarn is drawn under tension through several guides and eventually wound onto reels. The yarn is dried, packed according to quality, and is now raw silk ready for marketing. Indian silk industry produces basically four types of silks namely Mulberry, Muga, Tasar, and Eri silk. Karnataka, Andhra Pradesh, Tamil Nadu, Jharkhand, Chhattisgarh, Orissa, Jammu & Kashmir and West Bengal are the major hubs of Indian silk industry. The traditional silk sarees like the Kanjeevaram sarees, Banarasi sarees, Konrad sarees, Mysore silk sarees, Pochampally Ikat sarees, Chanderi sarees, Paithani sarees, Patola sarees, Baluchari sarees, Bomkai sarees, Tasar sarees etc., are the exclusive creations of the artisans who use silk as the base material for these sarees. Among non-mulberry silks, Tasar is mostly produced by tribal people settled in different parts and regions of India. Workers in sericulture industry are exposed to a number of health hazards. Various reproductive and menstrual risk factors for endometrial cancer have been identified, whereas few occupational or environmental risk factors have been explored. Several studies have investigated exposure to insecticides, specifically Organochlorine compounds, but no consistent associations have been reported. Although solvents are considered endocrine disruptors, the only study to date to specifically address solvent exposure and endometrial cancer detected no association (Wernli et al.2008). An association between occupational exposures and health nested within a large cohort of silk workers in India is reviewed here. Wani and Jaiswal (2011) reported that majority of the rearers in Kashmir are suffering from health problems like, eye irritation, injuries, back pain, allergies, respiratory problems and headache. Unhygienic conditions due to accumulation of unutilized leaves and silkworm excreta pose health risk. Any negligence of hygiene leads to silkworm mortality due to two main diseases Grasserie & Flacherie. The dead silkworms, if not removed immediately, putrify and cause illness among rearers. HCHO has strong irritant effect on the eyes and nasal mucous, when present in the air at levels exceeding 0.1ppm. HCHO is a carcinogen. 2% solution of formaline is employed for spray in the rearing room and on rearing appliances such as trays in a closed room a day before the onset of rearing work. 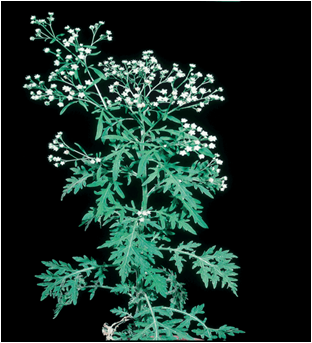 Glyphosate is employed to control monocotyledon weeds such as Liver seed grass, Urochloa panicoides and Kyllinga brevifolia etc.Carcinogenic potential of Glyphosate , at extremely low concentration, is confirmed. In the process of silkworm eggs production, male and female moths emerge from the cocoons, copulate and female moths lay eggs. The wings of moth are minutely scaled. The scale allergens trigger asthma, and Conjunctivitis. Around 9% grainage workers suffer from these problems. 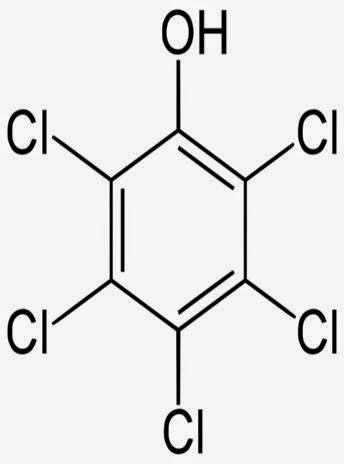 Government of India has notified Indian Eco Standards (Table-I) and prohibited manufacture and use of Benzidine based 70 dyes, which are known to break down into aryl amines. The enzyme, azo-reductase, breaks down azo dye molecules into aromatic amines which are then absorbed in the intestine. These are especially hazardous to the workforce. The exporter of silk, have to make sure that their products do not carry any of the azo dyes that are prohibited in the western countries (EU). 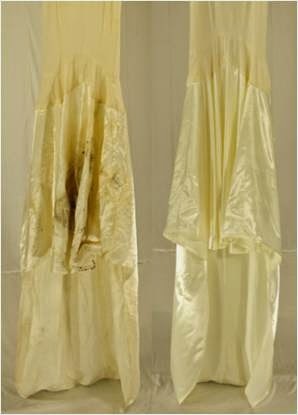 Metal Complex Dyes are known for its fastness properties and hence find application in dyeing of silk. Antimony, arsenic, bismuth, cadmium, cerium, chromium, cobalt, copper, gallium, gold, iron, lead, manganese, mercury, nickel, platinum, silver, tellurium,t hallium, tin, uranium,vanadium,and zinc comes under heavy metals category. 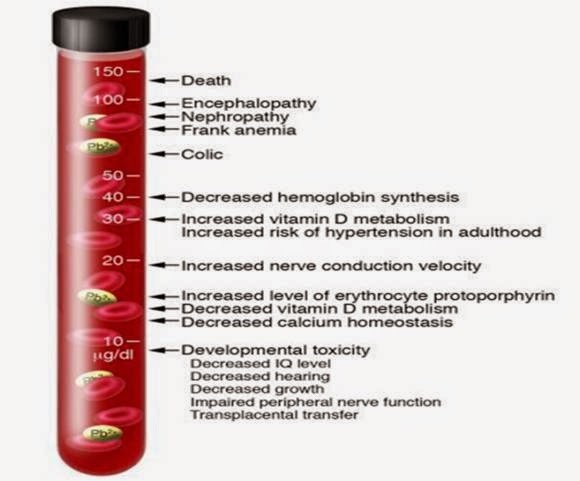 Heavy metal toxicity can result in damaged or reduced mental and central nervous function, lower energy levels, and damage to blood composition, lungs, kidneys,and liver. Trivalent Chromium is used to fix silk dyes. It undergoes oxidation into Hexavalent Chromium. Exposure to Hexavalent chromium is hazardous to human health and increase the risk of developing lung cancer. Dermal exposure to Cr (VI) leads to skin irritation, ulcers, sensitization, and allergic contact dermatitis. Lead is used in Lead acetate for dyeing of silk cloth, Lead molybdate in pigments used in dyestuffs and Lead nitrate in mordant in dyeing and oxidizer in dyeing .Lead is a neurotoxin – it affects the human brain and cognitive development, as well as the reproductive system. Some of the kinds of neurological damage caused by lead are not reversible. Specifically, it affects reading and reasoning abilities in children, and is also linked to hearing loss, speech delay, balance difficulties and violent tendencies. Dye factories across the world are dumping millions of tons of dye effluent into rivers. 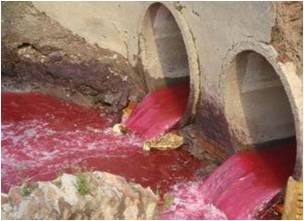 The dyeing effluents contain azo dyes, chromium, heavy metals etc. In accordance with a Madras High court order, around 400 dyeing units were shut down by 2012 and their operating licences were cancelled and the power connections snapped. Only the factories that installed reverse osmosis equipment were allowed to operate. 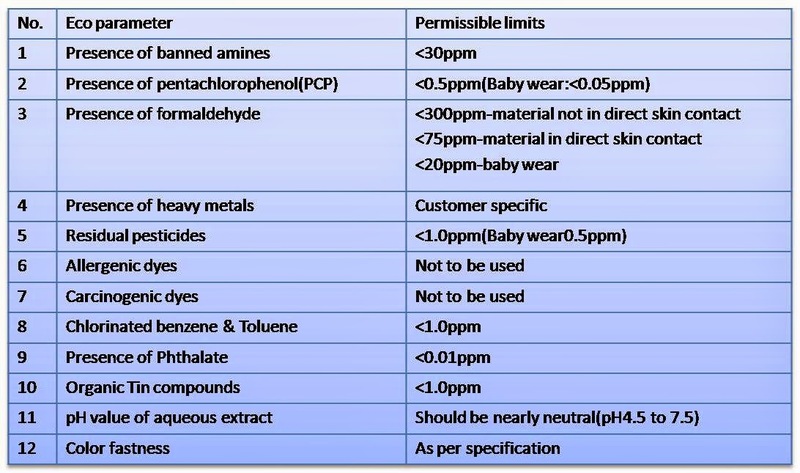 Health Risk from Pentachlorophenol (PCP) Organochlorine compound such as PCP are used in spray starch before ironing silk saree/garment to protect from mould attack. In humans, its bioaccumulation takes place and poses severe health hazard. Pentachlorophenol is a common ingredient in spray starch that often irritates the lungs. It is also used in dyes and printing to fix the design and prevent "running". 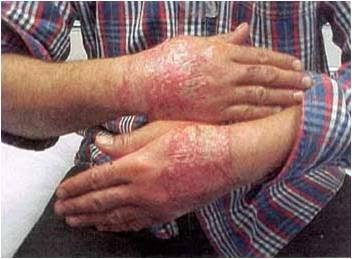 Eczematous scaly rash occurred after the patient wore a cap containing formaldehyde resins in the silk inner lining. Human skin has a pH of about 5.5, acting as a barrier to bacteria, viruses and contaminations. Contact with materials with a pH outside the accepted range turns the skin flora out of balance and causes irritations. Eco mark (India) restricts pH of aqueous extract of the fibres between 4.0 and 7.5. Various types of occupational disorders are associated with silk industry such as, respiratory disorders, injuries, eyesight problems, nerve disorders, and carcinogenic skin problems. Most of these health risk factors can be avoided by proper precautions. Awareness programme and local group discussions are essential for improving the health status of these workers. 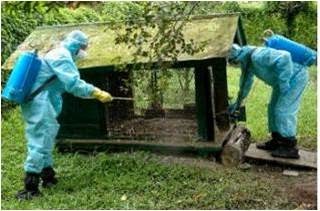 There must be some provision of protecting equipments such as face masks, first aid facility, gloves and proper uniform. Silk mark protects the interests of consumers, who are being cheated by traders by selling spurious products in the name of silk. So far silk mark authorities test cocoons and raw silk only. In order to safe guard health of the consumers, the silk mark should be clubbed with silk testing with reference to eco parameters of Textile testing laboratories as per the norms of Bureau of Indian Standards. Nadiger G.S. (2001)Azo ban,econorms and testing. Indian J. Fibre Text.Res.Mar-Jun, 55-60. Wani, K.A. and Y.K.Jaiswal (2011a) Health hazards of rearing silkworms and environmental impact assessment of rearing households of Kashmir, India. Nature Environment and Pollution Technology, 10, (1), 85-90. A review. Asian J.Exp.Biol.Sci.2 (1), 135-138. Wernli, K.J.,R.M.Ray, D.LiGao, E.D.,Fitzgibbons,J.E.,Camp,,G.Astrakianakis, W.Li, A.J.DeRoos, Z. Feng, D. B Thomas, and H. Checkoway (2008). Occupational Risk Factors for Endometrial Cancer among Textile Workers in Shanghai, China. Am J Ind Med. Sep 2008; 51(9): 673–679. Yousuf, T., I Khan, T. Yousuf and T.Raja (2013) Socio economic profile of silk weavers: A micro level study of Srinagar city. European Acad.Res. 1, (3), June, 319-331.